As the first product Genie introduced when the company began in 1966, the Genie Hoist Claunched thousands of lifts. Today, Genie offers a complete line of portable, self-contained material lifts that are easy for one person to transport and use for a variety of light, heavy and specialized material lifting tasks. Applications include lifting items such as HVAC, electrical and building materials as well as appliances, computers, warehouse stock, stage lighting and sound equipment. The hoist is powered by either CO2 or compressed air. A Cone size fits all bottle-mounting bracket accepts any common CO2 bottle size, and the hose stretches 16 ft (4.87 m) for added mobility. Up and down functions can all be activated from the patented pistol-grip control handle. The Super Hoist sets up in seconds 4 no tools required. The unit s compact size and weight allow one person to lift and move heavy loads, yet quickly move from job to job. It s so portable, it fits in the trunk of most cars. With the Genie Load Lifter , one person can easily lift, move and position heavy loads 4 from computers and electronic equipment to small appliances or manufactured parts. Compact and portable, it lifts up to 200 lbs (91 kg) to a height of 5 ft 7 in (1.7 m). The quiet, high-speed reversible winch quickly lifts and lowers heavy loads with high-strength, aircraft-quality cable that is vinyl-coated for longer life. The Load Lifter folds for compact storage 4 no tools required 4 and loads easily into a pickup for transport. At just 58 lbs (26 kg), this durable, corrosion-resistant aluminum unit is easy for one person to carry and maneuver. Features include a beveled aluminum platform for easy loading, as well as standard non-marking rear wheels and built-in stair glides for handling over stairs and curbs. Optional front-swivel, non-marking casters and field-installable foot brakes are also available. With three base models and many accessories to choose from, the Genie Lift is ideal for a wide variety of tasks, including shipping/receiving, lifting heavy material to or from shelves, installing and repairing HVAC components, lifting and moving automotive parts, and other manufacturing applications. Choose the adjustable straddle base for small pallets, appliances or bulky objects. The shorter legs on the counterweight base allow you to get closer to loads on countertops or shelves. Plus, the standard base offers a low loading height suited for general lifting and material delivery. The telescoping aluminum frame makes the unit compact, the steel forks and winch handle are reversible for flexibility, and a hold-down mechanism secures the carriage for easy transport and storage. An electric winch, a ladder accessory and a load-handling platform are available to customize your lift. The boom option turns your Genie Lift into a vertical crane or hoist capable of lifting 210 to 500 lbs (95 to 227 kg) with up to 20 in (51 cm) of reach. Designed specifically for the construction industry, these heavy-duty units can be operated by one person and can lift, lower and move loads up to 650 lbs (295 kg) to heights of up to 24 ft (7.32 m). Glide rails allow one person to easily load or unload the unit, as well as lift it in or out of a pickup truck. Quick setup requires no tools. Plus, the heavy-duty, patented telescoping mast system stows in a compact position. Legs fold up and attachments are removable for easy storage. Shift gears Con the fly and lift loads faster with the exclusive, constant mesh two-speed manual winch that lets you change gears without removing or re-attaching handles. Choose from a range of load-handling accessories, such as standard and adjustable forks, a boom, a load platform, a pipe cradle and fork extensions. The Genie Superlift Advantage is a manually operated lift with multiple base, winch and load handling options to create just the lift you need. The compact, portable design rolls through standard single doorways in the upright position and is easy to load into a pickup truck. Choose your base, mast height and load handling attachments to design the exact lift that meets your needs. You can also select the standard one-speed winch, which incorporates a silent ratchet system, or the two-speed winch upgrade, which allows you to shift gears Con the fly. The unit sets up quickly without any tools and is ready to go to work in seconds. The rear transport wheel also allows maneuverability on uneven surfaces. Legs fold up and attachments are removable for easy storage and loading. The patented, field-proven telescoping mast system is compact, strong and rigid. 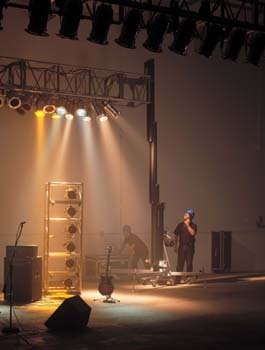 Designed for theatrical productions and entertainment events, the Genie Super Tower telescopes lighting, sound systems and scenery weighing up to 800 lbs (363 kg) and can lift to heights up to 26 ft .5 in (7.94 m). In addition, the standard flat black anodized finish blends in so well backstage, it s virtually unnoticeable to the audience. The compact stowed position makes the Super Tower easy to move through doors and load on trucks with no bulky base to get in the way. Just install the outriggers and set the leveling jacks. A two-speed winch option allows you to shift gears during operation. The load platform option fits over standard forks with no tools required and handles heavy or odd-shaped objects. Plus, fork extensions are available to insert on standard forks for an additional 25 in (64 cm) of length. Portable Genie Super Series aerial work platforms are simple for o ne person to set up in minutes. A durable, lightweight design and compact s ize make them ideal personnel lifts for rental, light-duty construction and maintenance. The patented rigid mast system offers us er comfort and stability at working heights of up to 46 ft 4 in (14.29 m). Other features include ground and platform controls with auxiliary platform lowering for use in the event of a power outage. Outfit your lift for specific appl ications with options such as three bases and six platforms, as well as AC, DC and air-motor power options. This accessory allows you to position and use your Genie AWP over obstacles and stairwells. It assem bles without tools. The Super-Straddle provides up to 40 inches (1.01m) of vertical clearance and features four non-marking casters. The end-frames ad just for leveling on sloping floors up to 5 degrees. These lifts let you set up in seconds and work at heights of up to 35 ft 6 in (11 m) with exceptional stability 4 no outriggers needed. Wit h two base options and six platform options, you can choose the ideal model to fit your application. The standard base model easily rolls through standard doorways, and wide-base models roll through typical indust rial double doorways. A rigid aluminum mast, automa tic level sensing and integral leveling jacks offer exceptional stability. Plus, the standard platform is one of the industry s largest. All models are equipped with an auxiliary platform-lowering feature for use in the event of a power outage. An outreach option provides over 2 ft (61 cm) of additional horizontal out reach (IWP -20S) to maneuver over shelves or equipment. Power failure protection. All AC and DC models are equipped with an aux iliary platform lowering feature. These models roll easily through congested areas and offer ample space f or two workers and their tools on the larger platform. They feature easy-to -use controls and exceptional stability, as well as auxiliary platform lowe ring. The DPL rolls through standa rd doorways with a handle for convenient steering. Swivel lock casters allo w 360=CB=9A rotation in confined spaces. AC (110 V or 220 V) and DC ( 12 V) power options are available, offering clean, quiet operation for indo or or outdoor use. Platform-mounted GFCI 110 V electrical outlet is standar d.
Outrigger storage, forklift pockets and tie-down points help secure these units for easy transport, while winc h attachment points are convenient for loading on roll-back trucks. 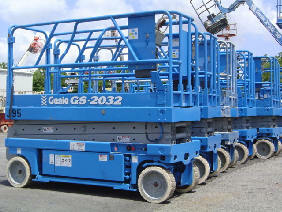 The Genie Runabout is ideal for stock-picking, transporti ng, inventory management, general maintenance and construction. It s a compact, low-weight machine that is driveable when fully elevated for m aximum productivity. These models fit in most passenger el evators and can be driven through doorways with the operator on board. Zero inside turning radius, 30% gradeability, a spring-applied hydraulically released brake system and non -marking solid rubber tires enhance maneuverability. Platform controls include on-board diagnostics, and proportional lift and drive controls provide a smooth ride . Auxiliary platform lowering enables descent in the event of a power failu re. *Gradeability applies to driving on slopes. See operato rs manual for details regarding slope rating. **Weight will vary dependi ng on options and/or country options. These models provide the Cup, over and out working enve lope of a Z -boom with convenient built-in towing capabilities. The y offer one of the industry s best operating envelopes, with flexib ility to reach jobs high and low. Lightweight and maneuverable, they're ideal for congested jobsites and are frequently used by contractors, maintenance crews and painters. Special features include the exclusive Geni e Automatic Leveling System on all models and the Drive and Set option on the TZ -50. With a variety of hitch cou pler options, Genie trailer-mounted Z -booms are easily towed behind a pickup or SUV. Hydraulic outriggers with automatic self-leveling allow machine setup in as little as 40 seconds. Both ground and platform cont rols feature an easy-to-use pictograph system, so operators can get to work quickly. Although rugged and heavy-duty, t he TZ -34/20 is lightweight enough to use on lawns, slate or gymnas ium floors. Or choose the TZ -50 for exceptional value with excepti onal working range. The TZ -50 also offers an articulating jib boom option for expanded working range, and the Drive and Set option f or ultimate flexibility to position the unit quickly and efficiently. Whether you&apos;re looking for a cost-efficient workhorse or the ul timate in flexibility, Genie and Terex offer a range of portabl e, heavy-duty models to fit virtually any lighting need. These units illumi nate areas with poor light or at night with quick, easy setup, user-friendl y controls, industry-proven components and 60 to 100 hours of continuous ru n time between refueling. From construction sites and sporting events to mi nes and oil fields, each model is built to deliver consistent, reliable lig ht on your site.